Each week, Big Issues focuses on a newly released comic-book issue of significance. This week, it’s Spider-Men #4. Written by Brian Michael Bendis (Daredevil, Avengers Assemble) and drawn by Sara Pichelli (Ultimate Comics Spider-Man, Runaways), it’s a prime example of how to write an alternate-universe story that resonates on an emotional level. Alternate realities are one of the cornerstones of superhero comic books, an easy way to show familiar characters in new situations without making radical changes to a central universe that’s shared across multiple titles. A successful alternate-reality story should a) explore the similarities and differences between variations of the same hero, b) have an emotional hook that personally invests the protagonist in the alternate world, and c) force the character to confront a significant “What if?” But ultimately, the journey to a foreign dimension or dystopian future should reveal something significant about the hero that the ordinary reality doesn’t, and Spider-Men #4 does exactly that. Marvel’s Ultimate line of comics was created in 2000 as a way to reintroduce classic characters to modern audiences, with Brian Michael Bendis’ Ultimate Spider-Man anchoring the line. When the Ultimate titles began to dip in popularity, Bendis revived interest by killing off Peter Parker and replacing him with a new, biracial Spider-Man: Miles Morales. Spider-Men is the first crossover between Earth-616 (the main branch of the Marvel universe) and the alternate Ultimate reality, and after a rocky first issue, the miniseries has really come together as 616 Peter Parker adapts to the new world around him. The second issue showed Peter’s reactions to his much-younger but equally quippy replacement Miles, and began to set up Peter’s emotional investment in a universe where he’s publicly admired for his work as Spider-Man, but also dead. Issue #3 shifted away from the character drama for an action-heavy installment, but with the appearance of Aunt May and Gwen Stacy in the final pages, set the stage for a dramatic showdown in this penultimate issue. Bendis’ decompressed storytelling has its problems, but his pacing is perfect in this issue. Spider-Men #4 picks up moments after last issue’s cliffhanger, with May and Gwen standing on their front lawn, confronted by a fully grown Peter Parker. They initially react in anger, with May slapping the supposed imposter to the ground and Gwen kicking him before Miles tells them it’s really Peter, prompting May to pass out in shock. Then, the story jumps to Nick Fury and Tony Stark at the Triskelion to alleviate some of the tension before checking in with a character who hasn’t been seen much in the Ultimate universe since Peter Parker’s death: Mary Jane Watson. Spider-Man’s favorite redhead has taken a turn for the goth, and Peter’s return doesn’t do much to help her emotional state. The main draw of Bendis’ Ultimate Comics Spider-Man has been the character work, and it’s been nice to see the writer return to some of his most fully developed characters over the past few months. Readers have gotten glimpses of May and Gwen in recent issues of Miles Morales’ solo title, but Spider-Men #4 puts the focus back on these characters to show the continuing emotional ramifications of Peter’s death. The appearance of adult Peter gives May and Gwen the opportunity to come to terms with the death of their Peter, and witnessing this emotional reunion shows Miles the weight of the legacy he carries. 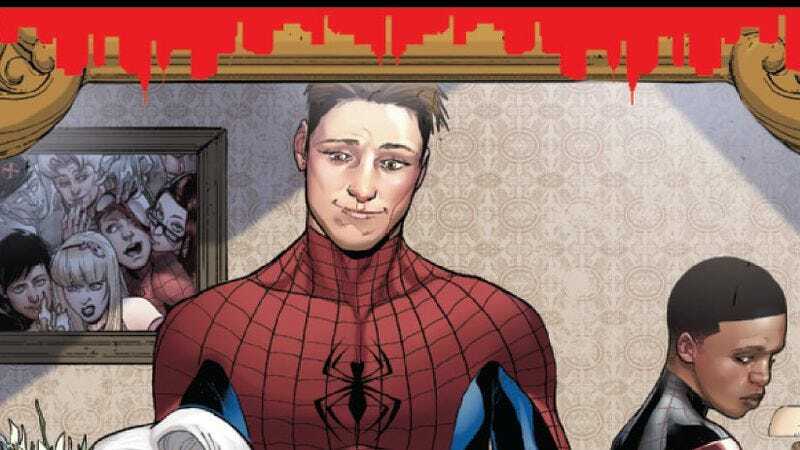 Spider-Men is still a Bendis book, so there are plenty of winking references to how the Ultimate universe has altered familiar Marvel characters. This could be seen as Bendis patting himself on the back for his past storylines on this title, but when someone has been writing a book for more than 10 years, he’s allowed some self-congratulating moments. These moments are mostly intended for comedy—like Peter’s shock over finding out that he dated Kitty Pryde of the X-Men—but Bendis also knows how to explore the discrepancies for dramatic effect. In spite of Gwen’s insistence, Peter never reveals her fate in his timeline, and Peter can’t help but comment when he notices Ultimate Tony Stark boozing it up while trying to break down the barrier between dimensions. Spider-Men #4 is an incredibly affectionate comic, which is not a descriptor used very often for superhero comics. Bendis trusts Sara Pichelli to capture that tone in her artwork, and there are many silent panels of people simply hugging or waving to each other, simple images that are cathartic considering what these characters have had to endure. Pichelli has quickly become one of Marvel’s superstar artists, remarkably skilled at drawing dramatic widescreen visuals, with an even stronger talent for capturing a script’s subtle emotional beats. No one has suffered more in this series than May Parker, and Pichelli does a stunning job of illustrating the effect Peter’s death and reappearance has on his aunt. After Mary Jane is introduced, the issue returns to the Parker household, where the unconscious May is on the living-room couch. The scene begins with two panels of no dialogue as May wakes up alone, unsure of what exactly has happened. The angle of the third panel zooms out to show May in the background with the rest of the house shadowed in the foreground, a small, seemingly insignificant shot that emphasizes the emptiness of the home without Peter there. As May gets off the couch, she hears the voices of Gwen, Peter, and Miles from upstairs, and she moves hesitantly toward them. It isn’t easy to capture passive qualities like reluctance through art, but Pichelli does beautiful work reflecting May’s uncertainty in her facial expressions and body language. While Peter’s appearance allows Gwen and May to accept his death, it only reopens old wounds for Mary Jane, who refuses to come in contact with him. As Miles and Peter get ready to leave the Parker house, Mary Jane lurks in the background and runs off when Peter notices her. The image of Mary Jane curled up against a brick wall with tears in her eyes is a smart way to end her storyline, showing that it’s not as easy for some people to move on. The path to healing is different for everyone, and Mary Jane has just started on hers; hopefully it will be more fully explored in the pages of Ultimate Comics Spider-Man. As Miles Morales’ solo title heads into its second year, Spider-Men is a burst of momentum that integrates elements of the old series into the new, showing there’s still plenty of storytelling potential in Marvel’s Ultimate universe. In this world without Peter Parker, Bendis and Pichelli (and Ultimate Comics Spider-Man artist David Marquez) have found a way to build on the core values of Spider-Man in intriguing new ways. When Nick Fury tells Miles to go back to school at the end of the issue, Peter Parker stands up for his replacement and says, “I’d like him to stick around too if that’s okay.” As long as Bendis and his team continue telling stories with this level of quality, Miles shouldn’t be going away any time soon.